The release of the latest 840-horsepower Dodge Challenger SRT Demon has caused a lot of stir online over the last few months, but the classic Dodge Challenger is still the best when it comes to an investment. Although the latest Challenger has more power and a 0-60 mph time of 2.3 seconds, the 1970-74 models are still the most popular, according to searches and queries on Hagerty.com. It’s not really surprising considering the near 50 year back history of the Dodge Challenger and all the on-screen appearances from the mighty machine over the years. Gone in 60 Seconds, Vanishing Point, Death Proof and the many appearances on TV have cemented the Challenger in everyone’s mind as one of the primary muscle cars in the world. 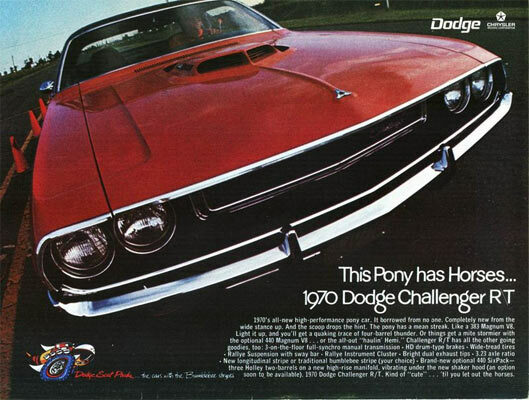 The original Dodge Challenger was a by-product of the success from the Mustang the Camaro, which came along in six different engine variations from the humble in-line 6 to the mighty Hemi, selling 83,000 units in the first year with a pricetag of $2,953 for a hardtop to $3500 for the R/T convertible. Performance was always the key aspect of the Dodge Challenger, but like the rest of the muscle car pack, it’s the rare option vehicles which are now worth the most money. The two-door coupe was available in hardtop convertible format, with variations like the R/T and Hemi’s now fetching the most money. A 440cc.i. (7.2 L) V8 Six-Pack or 426 cu in (6.98 L) Hemi V8 engine is the most sought-after engine types. Values for Challengers from 1970 to 1974 have gone up by 28% according to Hagerty, with values this year rising 4% to $34,700. Models from 1970 to 71 are worth the most money as 72 models and thereafter had a redesign and were hit with emissions and insurance legislation of the time. This makes them 41% higher in value than 1972-74 Challengers. As an example a 1970 Challenger R/T Hemi Convertible is worth $931,000 with a 1970 Challenger T/A Hardtop worth $93,800 in prime condition. values are expected to increase year-on-year, so these vehicles make great investments in the long run. There are many factors that go into the worth of a Dodge Challenger such as condition, numbers produced, mileage, back story and rare options. A vehicle only made with a few optional extras can make all the difference. These options were ordered back in the day on each new vehicle almost like items for menu. You ordered which options you required on your new car and then got delivery. Those who ordered coincidentally the rarest permutation of options are now worth the most. A 1970 Dodge Challenger R/T Hemi Convertible sold for a record price of $1,815,000 in January 2016 at Mecum auctions being only one of nine as a convertible with a Hemi engine. A 1971 Dodge Challenger hard top version sold for $691,200 at Mecum in 2015, being only one of 70 Hemi Challengers made in 1971 and only 1 of 36 known to exist today. However, there are still base model examples available in good condition for around $30,000+ if you shop around. You can also buy project vehicles which need restoring, but these need a far more knowledge and experience to get back in shape. You can obviously check out our muscle cars for sale section, which lists daily Dodge Challengers. There are many standout keywords when it comes to a rarity, such as ‘numbers matching’ meaning it has the original engine and transmission, one owner, low mileage, documentation, rare options, paint color, back history, condition and the list goes on. As with any vehicle, the better and more original the condition, the more the vehicle is worth. With these older vehicles the condition of the body work is paramount, as a replacement powertrain is easier to source than a completely rebuilt car body. You can source mechanical parts relatively easily, but repairing a rusted up car body is far more work and potential expense. The Dodge Challenger, just like any other muscle car will increase in value and if you buy an example in good condition that can be driven daily, you don’t just have an investment, but also a vehicle that will sound fantastic and give you tons of driving pleasure for the foreseeable future. What’s not to like about the Dodge Challenger.